Defense Secretary Ash Carter addresses service members at Naval Submarine Base New London in Groton, Conn., May 24, 2016. Carter commended them for their work and asked them to help in attracting and retaining their successors. 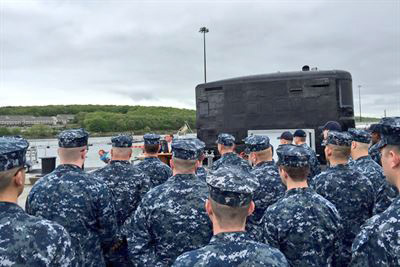 Protecting the nation and much of the world is a U.S. duty because of the challenges and opportunities that exist, Defense Secretary Ash Carter told service members at Naval Submarine Base New London in Groton, Connecticut, May 24. The secretary toured an operational Virginia-class submarine and said he is confident in U.S. undersea superiority as a great military strength, telling the service members their work reaches far, including the campaign to defeat the Islamic State of Iraq and the Levant. The United States must retain its lead over the capabilities of countries such as Russia and China, he said, adding that the nation also must keep vigilant watch over Iran and North Korea. The secretary emphasized two points in his troop talk. 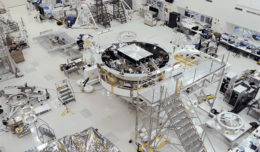 The first is that continuing to be the best requires the United States to have a competitive mentality and always think, innovate, absorb the newest technology, look outside the walls and be willing to take ideas. The secretary asked the service members to think about what would bring people with their abilities into the military and what would retain for 10, 20 or 30 years. Carter said he’s aware that sacrifices are vital to service, and such matters should be minimized when possible. “I don’t take it for granted that you’re here,” the secretary said. ‘I very much appreciate it. You’re talented people.” Though they have alternatives to serving in the military, he told the service members, they stick with it because they love it — the mission, their shipmates and their country.